Dust is a reality for anyone in landscape construction. 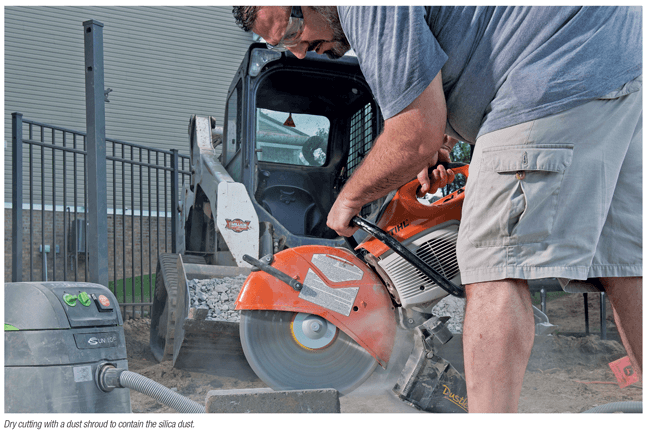 When you inhale dust from cutting or grinding concrete, mixing materials, dry sweeping or demolition, tiny quartz/silica particles penetrate deep into the lungs and cause scarring and disease. 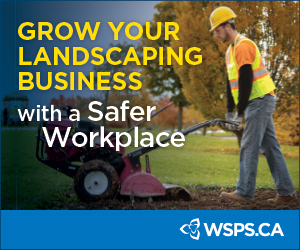 The risks are so serious, regulations have been put in place for Canada by the Canadian Centre for Occupational Health and Safety (CCOHS) and for the U.S. by Occupational Safety and Health Administration (OSHA), to create awareness and manage this risk at worksites. The goal is to create safer work environments with reduced health risks for you, your employees and anyone exposed to construction dust. Crystalline silica is an extremely common mineral found in sand, stone, and concrete that becomes dangerous when disturbed. Cutting, crushing, grinding, or drilling of stone, brick or concrete generates a fine silica dust that, unless contained, will seriously contaminate the air. Inhaled silica dust causes fibrosis or scar tissue, as well as silicosis lung disease, both of which reduce the lungs’ ability to extract oxygen from the air. There is no cure for these often-fatal diseases. In Canada, the CCOHS is a great place to start for information. There are 14 jurisdictions that have their own Occupational Health and Safety legislation, including occupational silica exposure limits. 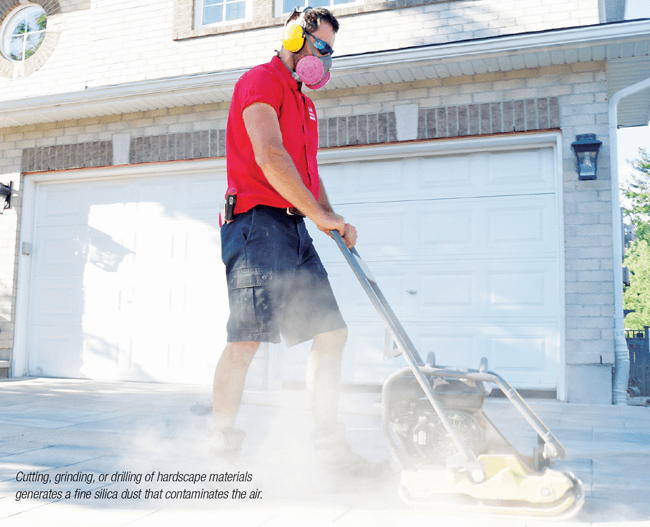 You can find the exposure limits and links to the legislation for each province in the online version of this article at www.landscapetrades.com/silica. In Ontario, for example, the legislation does more than specify exposure limits. It also requires employers to take steps to protect employees from the hazard and defines employer responsibilities if exposure takes place. Generally, Canadian regulations are comparable to U.S. regulations. However, violations in the U.S. are expensive; fines of over $7,500 per person are given for breach of the Silica Regulation. With the importance given to the silica issue in the U.S., we are likely to see similar enforcement and fines in Canada in the near future. One way to determine silica exposure is through air monitoring. This may seem like a complicated, expensive process; however, it’s fairly easy once you understand what is involved. Air monitoring equipment measures the air quality in a worker’s breathing area to determine silica exposure during a specific work practice. Air monitoring uses a battery-operated vacuum attached to an operator’s shirt collar, collecting air samples right where the operator breathes. Once you learn your exposure levels, you can decide what options are best suited to control silica exposure on your job sites. Another way to determine silica exposure is by using objective data provided by tool manufacturers. In the U.S., OSHA defines Objective Data as “information, such as air monitoring data, from industry-wide surveys or calculations based on the composition of a substance, demonstrating employee exposure to respirable crystalline silica associated with a particular product or material or a specific process, task, or activity. The data must reflect workplace conditions closely resembling or with a higher exposure potential than the processes, types of material, control methods, work practices, and environmental conditions in the employer’s current operations.” When a manufacturer tests its equipment, if the work practice and materials used match job site conditions, OSHA allows this data to be used as objective data as part of a written silica exposure control plan (https://plan.silica-safe.org). Hazard identification, assessment and solutions. Trained staff member for implementation and monitoring. A detailed list of control plan components is posted in the online version of this story, www.landscapetrades.com/silica. In my experience, the key to protecting yourself and your employees is to take responsibility and implement systems. Just because a tool is CCOHS Compliant, it does not automatically mean the company using the tool is compliant with the regulation. Dry cutting with a dust shroud. Dry cutting with integrated dust collection. 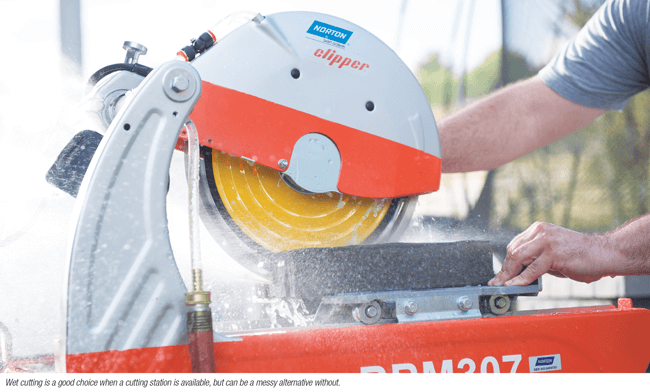 Wet cutting works well when you have a cutting station, but it can be very messy and can create problems like water damage to the base and/or bedding sand layer (if cutting pavers or walls in place), and staining with the wet dust sticking to the paver surface. Dustless vacuum systems and dust collecting systems vary in efficiency and effectiveness, but integrated systems can capture over 99 per cent of particulates. Elimination: Physically remove the hazard. Engineering controls: Isolate people from the hazard. Administrative controls: Change the way people work. Personal protective equipment: Least efficient, but mandatory. Know the hazard Understand the hazard and risks associated with silica exposure. Know the standard Understand the CCOHS Permissible Exposure Limit and what it means to you, your business and your workers. Know your exposure Understand how to use air monitoring to measure silica exposure levels — and understand the results. Know your options Understand your options, including tools, work practices and educational resources for controlling silica exposure on your job sites. Frank Bourque is a speaker, writer, consultant, entrepreneur and Interlocking Concrete Pavement Institute instructor who coaches hardscape pros across North America. Thanks to iQ Power Tools and Hulton Tool for photos and information used in this article.